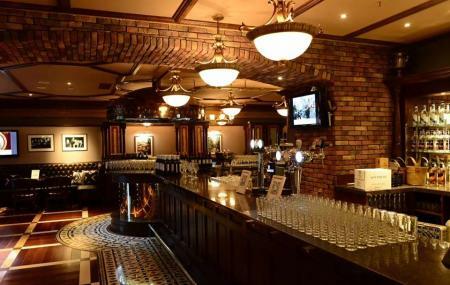 If you are searching for a place that has the best ambience and drinks then look no further as Molly Malone's, a pub in Beijing is sure to win your heart. The restaurant comes highly recommended for its drinks and food menu and is best known for its grilled food that the locals say is a must try. So take some time out and relax in this pub with your friends and family and have a great time. Bring your ID proof along with you. Take a bus from Campbell Street. How popular is Molly Malone's? People normally also visit Dongyue Temple while planning their trip to Molly Malone's. There are a many comments about the pricing ... yes it is priced far above average, compared with similar restaurants in prime locations at other big international cities ... BUT the quality is very good, service is o.k. and even though the place does not have a pub-atmosphere ... seats are comfortable and you have some privacy. Last but not least ... we have not found any Place in that area that could remotely compete. 135 rmb , 15 GBP for large Guinness .. one and only visit to this rip off joint ..
People who said that this place is not expensive must have been getting swindled their entire trip in China. 140 rmb for a burger is expensive. 50 rmb for a side of fries is expensive. Maybe the food is good, but considering this restaurant is surrounded by high-end hotels and Bugatti/McLaren dealerships, don't expect to eat on a budget. We usually have huge meals with beers for less than 100 rmb in Beijing...not getting that here. So we have been in China for two weeks and we needed a break from the food. This place really hit the spot. Good burgers, good service. Nice clean bar close to all the better hotels. Zero atmosphere and not very Irish. Food and drinks are good.